Various yoga poses can rev up your metabolism for hours. Your metabolism is the process of changing food and drink into energy. Your body is constantly changing nutrients into energy or storing it as fat. Increasing your metabolism can help speed up the process of converting food and beverages to energy. Kick-start your sluggish metabolism by engaging in physical exercise. Yoga moves and poses can help increase your metabolism and help you be more fit. The best way to lose weight is to eat healthy food and get plenty of exercise, such as doing yoga and other physical exercise. The Twisted Chair pose uses almost every muscle in your body, which can help improve your circulation, flexibility and increase your metabolism. Stand up straight with your feet close together. Bring your hands together with your palms touching in front of the center of your chest. Bend your knees and squat as if you are going to sit down in a chair. Twist your body as you bring your right elbow toward your left knee. Keep your back straight. Hold the position for 30 seconds and then repeat on the other side. The Locust post can boost your energy levels and increase your metabolism. This pose also strengthens your legs, back and increases flexibility. Lie on the floor on an exercise mat or a comfortable rug. Place your arms beside your body with your palms facing the ceiling. Lift your upper body off the floor. Lift your head back and up toward the ceiling. Lift your arms and legs upward toward the ceiling, too. When the pose is performed properly, your abdomen will support your body weight and upper thighs. Hold the position for 30 seconds and then relax your body. Do this exercise three times to boost your metabolism and increase your energy. The Full Boat pose, which Yoga Journal says stimulates the thyroid, is a little more difficult than the Locust pose or the Twisting Chair pose. Sit on the floor with your legs stretched out in front of your body. Rest your hands on the floor, palms down, behind your hips. Point your fingers toward your feet. Keep your back straight. Breathe out and then bend your knees and lift your feet off the floor until your thighs are lifted to a 45-degree angle. Stretch your arms forward until they are parallel to the floor. Your body should form a “V” shape with your arms straight out from the shoulders so that your hands are at the level of your knees. Hold this pose for up to 20 seconds and then inhale as you return to a sitting position. Check with your doctor before doing yoga if you have any joint or bone conditions, such as osteoporosis or arthritis. Pregnant women should only perform yoga with a doctor's permission. You risk muscle strains and joint injuries if you do not perform yoga poses properly. Find a qualified yoga instructor to help you learn how to do yoga poses. Take your time when doing yoga. Perform the moves slowly. Start with the basic moves and progress to more difficult poses as your flexibility and strength increase. Always warm up before any exercise to help avoid injury and reduce your risk of muscle soreness after exercising. Stop exercising immediately if you experience pain. 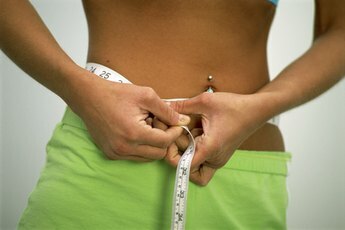 MayoClinic.com: Metabolism: What's the Best Way to Boost It?